Bone Reading Set being assembled. This is a set I assembled for a project. I talked about how I prepped the new bones for use here. I have added several more pieces to this set so I thought I would share a few of the pieces I have added and why. People – I have two pieces in this set to represent people. I added them for readings about relationships of various types. If a client is having a problem with their son, I designate one of the pieces as their son. If it is a romantic relationship one piece would represent the lover. If there were a third party involved the other person piece could be the third party. I already have a piece for the querent so I can see how the piece I have designated for the other person of interest falls in relation to the querent. If the question is not about a relationship I can either ignore these pieces or have them represent other parties who have a bearing on the situation. Almost any two things that can be distinguished from each other will work. 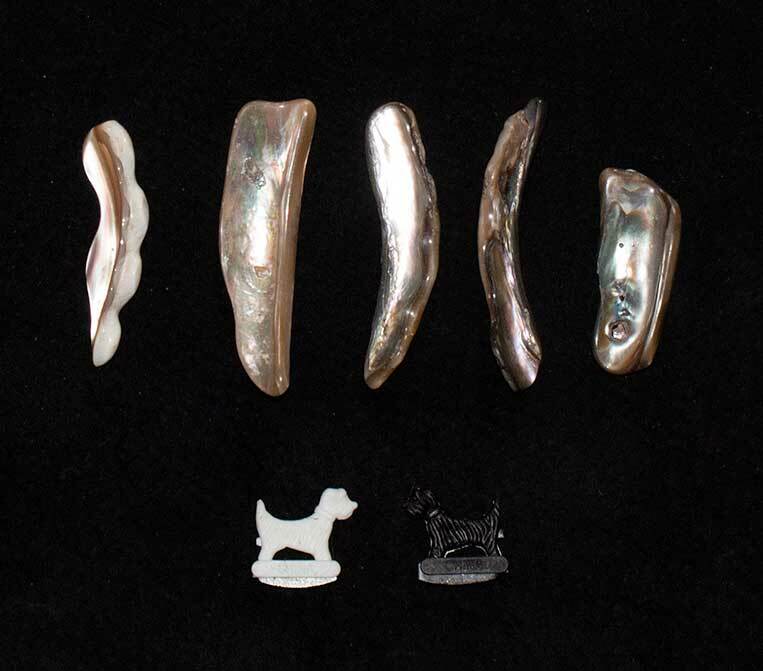 I have also used pieces of sea shell, and Magnetic Scottie Dogs. Ring – relationships, commitment, marriage, love. The large majority of readings I do concern relationships, and of those most concern romantic relationships. The ring provides an additional layer of information to the people pieces. Thimble – work, employment, enterprise. Some of my clients have work related questions. They need help finding a job, or they are having problems on their present job, or they may be thinking of leaving their job. I would also use this piece for business. It seems that many people these days are contemplating or have already started their own businesses. I get these types of questions enough to make including a specific piece for them worthwhile. Coin – money, finances, abundance, financial gain or loss. After relationships and work I would say financial questions were next in frequency. In fact relationship, romance, and work questions often contain a financial component. You don’t have to go out and buy these things. You can probably find everything you need around the house. 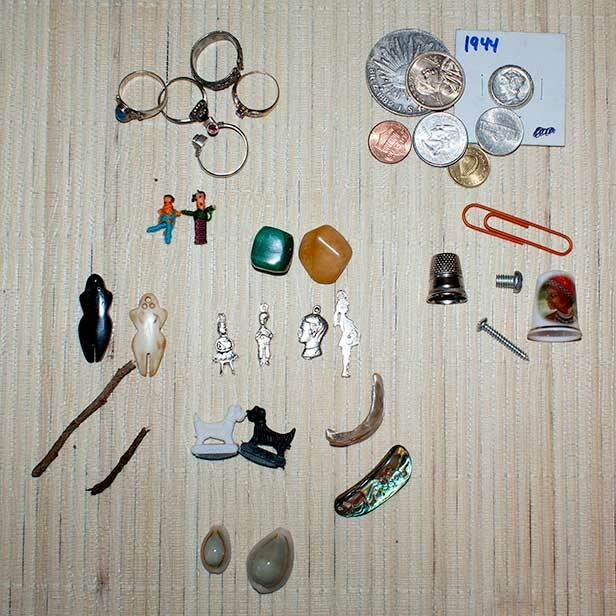 Two different sea shells or, stones, or even twigs that can be easily told apart can be used for people, A nut or bolt or even a paper clip can be used for work. Coins can be coins that you got from other countries if you have traveled, or they can come from the change in your pocket. Chances are that you have a ring, or a heart charm or something similar in your jewelry box or junk drawer. I previously talked about adding a piece for the querent here and a piece to represent the gifts the querent brings here. This set is still evolving and in future posts I will probably talk about some of the other pieces in this set. Additional pieces for bone set. I choose pieces because of their symbolism and their aesthetic. As an artist the set has to be visually pleasing in order for me to enjoy it fully. This along with my life experiences and other personal preferences drives my choice of pieces for my set. You may decide that you do not need any of these pieces in your set, or you may like the idea of some of these pieces but choose totally different items to symbolize them. No worries. Your bone set will be unique and personal. Your choices about what to add will reflect your tastes and experiences. It’s all good. I just got back from Forestville, where I did a workshop on How to Create Your Own Tarot Deck. I also did some bone readings and I got to see and talk to several other bone readers. I was not able to attend every workshop but I learned so much from those that I did attend, and I got to see many old and dear friends. I also picked up some new things from Lucky Mojo that I will be sharing here. 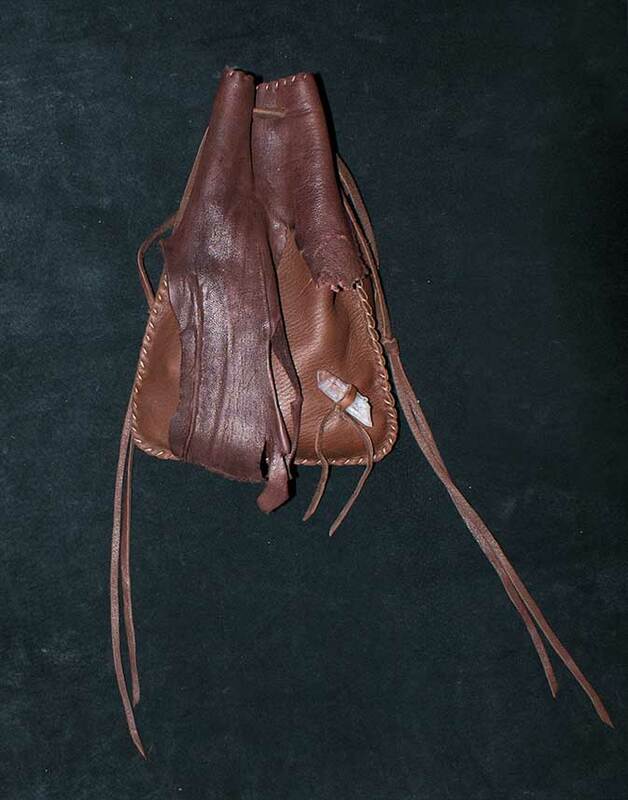 I had been on the lookout for a nice bag to carry things that I use in some bone readings that I don’t keep in my bone box. Mostly extra pieces like the abalone shell pieces that I sometimes use to represent people. I got the idea from cat yronwode, who mentions using Magnetic Scottie Dogs to represent couples. I started out using the Scottie Dogs for relationship readings, but I noticed that they were the only pieces in my set that were not made from natural materials so I replaced them with abalone shell pieces. If the reading concerns a relationship of some type I pick one piece to represent each party. They look different enough to be easily distinguishable in the throw. I still carry the Scottie Dogs in the bag too.